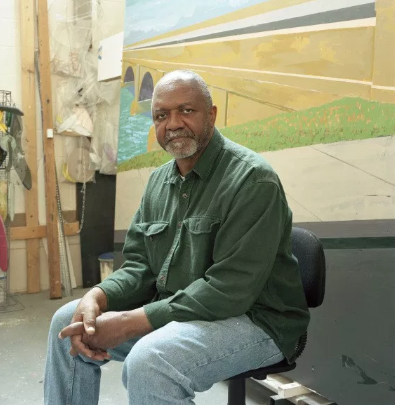 THE SECOND MOST POWERFUL person in the contemporary art world is Chicago painter Kerry James Marshall, according to Art Review magazine. The London-based publication issues an annual Power 100 list ranking the most influential figures in the contemporary art world. The list includes artists, curators, critics, collectors, and dealers, among others. Marshall is the top ranked artist on the list. In 2017, Marshall was on the bottom half of the list at No. 68. Then he assumed the mantle of the most expensive living African American artist in May when his monumental painting “Past Times” sold for more than $21 million (including fees) at Sotheby’s New York, an artist record. Advancing all the way up to No. 2 this year, Kerry James Marshall’s ranking is the highest-ever for a black person since the Power 100 list was inaugurated in 2002. Thelma Golden of the Studio Museum in Harlem was ranked No. 8 in 2017, which was the highest ranking at the time and marked the first year a black person had placed in the top 10. This year, three African Americans rank in the top 10—Marshall, Golden, and poet/critic Fred Moten, who is appearing on the list for the first time. Golden serves as director and chief curator at the Studio Museum in Harlem where construction of a new building designed by architect David Adjaye is expected to be completed in 2021. She oversaw a recent charitable auction at Sotheby’s New York that, thanks to the largess of 42 artists who donated their works, raised more than $20 million for the building project. Describing his regard, Art Review said: “Moten’s writing is an acknowledged influence on artists including Arthur Jafa, Glenn Ligon, Sondra Perry and Theaster Gates, with whom he shares a need to celebrate the radical traditions and rearticulate the contemporary experience of black Americans.” His trilogy, “consent not to be a single thing” was recently published. Art dealer David Zwirner tops the list occupying the No. 1 slot. With locations in New York and Hong Kong, his gallery represents Marshall and just announced the addition of Njideka Akunyili Crosby to its roster, which also includes Stan Douglas, Chris Ofili, and the estate of Roy DeCarava, among more than 75 artists. The No. 3 spot on the list is held by the #metoo movement. Established a year ago, the phenomena appears on the list for the first time. The “viral international movement denouncing sexual harassment and the abuse of women,” is a unique selection on a list that ordinarily features individuals. In addition to Moten, collector/philanthropist Pamela Joyner (No. 36), curator and critic Simon Njami (65), and artists Adrian Piper (49) and John Akomfrah (94), are also new entrants on the list. Joyner is board chair at the Tate Americas Foundation and also serves on the board of the J. Paul Getty Trust. Her extensive art collection forms the traveling exhibition “Solidary & Solitary: The Joyner/Giuffrida Collection” which is being presented at the Snite Museum of Art at the University of Notre Dame through Dec. 15. Njami has greatly influenced the lens through which the world sees contemporary African Art. He curated the 2017 and 2018 Dak’Art biennials in Senegal and is editor-in-chief of Revue Noire, a French magazine devoted to African art. A conceptual artist and philosopher, Piper was born in New York City. Her half-century survey exhibition is on view at the Hammer Museum in Los Angeles in partnership with the Institute of Contemporary Art Los Angeles (through Jan. 6, 2019). She moved to Berlin in 2005 and refuses to return to the United States because, according to her reconstructed Facebook page, she is “listed as a ‘Suspicious Traveler’ on the U.S. Transportation Security Administration Watch List.” Piper received the Golden Lion Award for Best Artist at the 56th Venice Biennale (2015) and Germany’s Käthe Kollwitz Prize (2018). The Institute of Contemporary Art Boston just announced Akomfrah will present the 2019 Watershed installation. “Purple,” his immersive, six-channel installation will make its U.S. debut on May 26, 2019. On view earlier this year at the New Museum in New York, “John Akomfrah: Signs of Empire,” was the Ghanaian-born, British filmmaker’s first American survey exhibition. Four African American artists return to the list from 2017—David Hammons (14), Theaster Gates (30), Kara Walker (50), and Arthur Jafa (87). Exploring African American identity through contemporary imagery, Jafa’s extraordinary video “Love is the Message, the Message is Death” (2016) is “a testament to [his] profound ability to mine, scrutinize, and reclaim media’s representational modes and strategies.” Compared with last year, Hammons and Walker improved their positions on the list; Gates and Jafa fell several ranks. MARSHALL HAS CAPTIVATED the art world in recent years. On the heels of his European exhibition “Painting and other Stuff,” when “Mastry,” his 30-year career-spanning survey opened at MCA Chicago in 2016, the show was universally praised and his stature rose significantly. In public conversations and catalog essays, Marshall speaks with authority about his own practice, the work of other artists, and the history of painting. In the wake of “Mastry,” an increasing number of paintings by Marshall began showing up at the major auction houses carrying higher and higher estimates. Following the record established by “Past Times,” Christie’s announced “Knowledge and “Wonder” (1995), a painting by Marshall made for a Chicago public library for a fee of $10,000, was set to come to auction with an estimate of $10 million-$15 million. When the artist, and many others, questioned the decision, the city heeded the outcry and reversed itself, pulling the painting from the auction. “History of Painting,” Marshall’s first exhibition since “Mastry,” was on view at David Zwirner in London and closed yesterday. “Through its formal acuity, Marshall’s work reveals and questions the social constructs of beauty, taste, and power,” the exhibition release said. Recently last year by Phaidon, “Kerry James Marshall” is a fully illustrated documentation of the artist’s career and includes a conversation with fellow artist Charles Gaines. “Kerry James Marshall: Mastry,” a comprehensive, cloth-covered catalog was published to accompany the artist’s 30-year survey. An extensive interview with Marshall is featured in the exhibition catalog “Painting and Other Stuff.” “Kerry James Marshall: Look See” coincided with the artists’s first exhibition with David Zwirner gallery in London in 2014. Newer PostSTUDIO JOSEPH, Founded by Wendy Evans Joseph, NA, Wins 3 AIA New York State Awards!